I-Radio is a 100% Indonesian music station! During its 24 hour broadcast, I Radio comes with good quality music from the era of 70s, 80s, 90s, to the millennium sounds. The kinds of music that we deliver are varied from pop, rock, jazz, hip hop, ballads, to alternative. We are the only station that does it the Indonesian way! 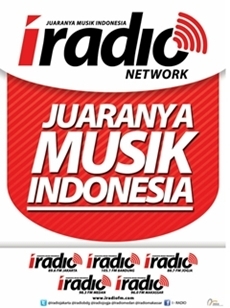 I-Radio carry four pillars, which are Indonesian, Informative, Interactive and Intermezzo. Listen to I-Radio in these cities : 89.6 FM I Radio Jakarta, 105.1 FM I Radio Bandung, 88.7 FM I Radio Jogjakarta, 98.3 FM I Radio Medan and 96.0 FM I Radio Makassar. In order to keep up with technology and the speed of information, I Radio Jakarta is now transmitting its program to Bandung, Yogyakarta, Medan and Makassar.